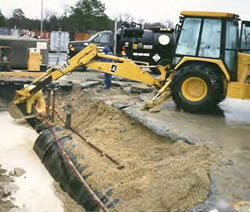 A2Z was contracted to remove a 4,000 gallon under-ground storage diesel fuel tank for Uni-First. The quote didn't include soil sampling, remediation of contaminated soil, or replacement of asphalt surface. A2Z scheduled a site visit with MDE (Maryland Depart-ment of the Environment). MDE dictated how to proceed with the removal of the UST. MDE will also decide how to proceed if we should confront fiber optics or other wires or pipes that would obstruct removal of the UST upon initial excavation. If obstructions are confronted, we may be allowed to fill the UST in place. No obstructions were found. Miss Utility was contacted so they could mark all known utilities in the work site. A2Z probed the tank with a measuring stick to make sure the tank was completely empty of product and to check the diameter of the tank. An excavator and backhoe were delivered to the worksite by an A2Z driver. 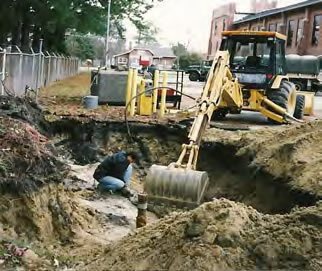 Excavation began to expose the top and sides of the tank. 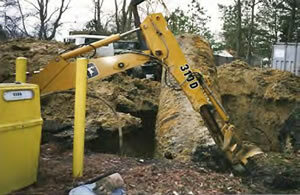 The excavation site was checked for contamination; none was found. The vent pipe, product pipe and return line were removed. The fill pipe was allowed to remain intact. The UST was raised, then scraped clean of dirt to expose any dam-age. There was no damage found during the MDE inspection. 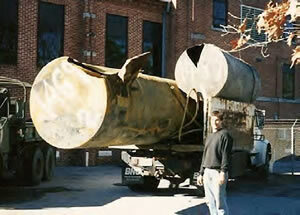 After the inspection, the tank was loaded in a roll-off container for disposal. Depending on the construction, the method of disposal will be chosen. This UST was made of steel. Therefore, it was cleaned, tested with an LEL for (lower explosion level), and passed MDE‟s requirements. Then it was dismantled and recy-cled by a local scrap recycler. If the UST had been made of fiberglass, the tank would be cleaned, tested for LEL, then broken up and disposed of in a local landfill. Once the UST was removed from the site, A2Z backfilled the hole with an approved backfill material, pea gravel. The work site was returned to grade, broom swept and all tools and equipment removed. A2Z then completed the closure report with MDE.